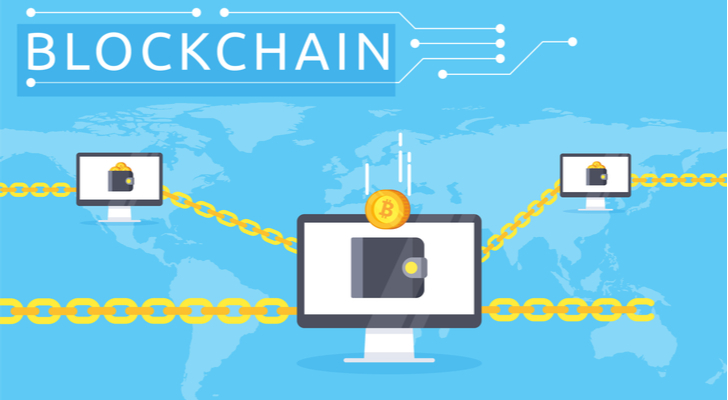 There is no question that there is a connection between blockchain and cryptocurrencies — without blockchain, cryptocurrencies wouldn’t exist. However, there is also a big difference when it comes to investing in a stock that focuses strictly on crypto versus one that centers on the technology that drives it. One stock that is as close to a pure play on cryptocurrencies as you can get is Bitcoin Investment Trust (OTCMKTS:GBTC), which basically tracks the price of bitcoin. As goes the price of bitcoin, so goes GBTC’s share price. But while bitcoin and other cryptocurrencies may end up being huge winners in the years ahead as the blockchain revolution continues, there are far less volatile investment ideas available to us right now. As I mentioned, the technology known as blockchain is what the cryptocurrency market is built on. But that’s not its only function — it is also being used to change nearly every industry that deals with transactions and ledgers. There are countless stocks out there currently benefiting from this trend, and some are more exciting than others. However, sometimes with more excitement comes more risk. Today I want to talk to you about two blockchain stocks that may not have the biggest “wow” factor, but do have a lot of upside potential over the long term. Broadridge Financial Solutions (NYSE:BR) is a stock that I have talked to you about before – in fact, it’s my pick in the Best Stocks for 2018 contest. BR provides investor communications and other solutions to the financial sector, and it’s one of the pioneers in its industry. But the real reason I like this $16 billion company is that it has also emerged as a standout when it comes to implementing blockchain technology. Many view BR as “boring” because much of its business centers on facilitating proxy votes and other financial transactions, but the stock has been anything but. Take a look at its performance so far this year. It’s up more than 50% in that time and easily beating the 8% return on the S&P 500. With momentum continuing to power this trend leader, I am confident there is a lot more upside to capture here. While IBM (NYSE:IBM) may not be the first company that comes to mind when discussing blockchain technology, it has actually been in the process of shifting its business model for a few years now. Revenue has declined annually as a result, but considering the blockchain portion of revenue also remains low there is huge upside potential that could ultimately be the catalyst to finally turn Big Blue around. The stock is down 4.5% so far this year and has failed to keep up with the broad benchmarks. I expect to see a shift soon, though, so the current weakness could be presenting a compelling opportunity. And as an added bonus, IBM pays out a hefty 4.3% dividend. It’s also worth noting that there are blockchain exchange-traded funds (ETFs) for those who want to take a broader approach to the budding trend. However, at this time I believe the best course is to build your own basket of stocks — kind of like your own ETF — and these two names should be considered to capitalize on the shift in how business will be conducted in the coming decades. Article printed from InvestorPlace Media, https://investorplace.com/2018/09/invest-technology-behind-bitcoin-blockchain-stocks/.